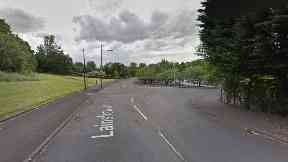 A man has been left with serious injuries after being stabbed on a street in Glasgow. The 21-year-old victim was taken to hospital following the knife attack in Lainshaw Drive, Castlemilk, shortly before 8pm on Monday night. Police are now investigating the attack. A spokeswoman said: "At around 7.40pm on Monday, police received a report of a 21-year-old man having been stabbed in Lainshaw Drive, near to Drakemire Drive. "His condition is serious, but stable.